Re: Arctic sea ice changes: Natural variation vs Human influence. "The changes in atmospheric circulation in the Arctic, thought to originate in the tropical Pacific, increase the amount of water vapour in the lower atmosphere, the paper explains. Together with a shift to fewer clouds, this has increased the amount of solar radiation reaching the ice." So when can we expect this natural variability to flip back again and see a reduction in the rate of Arctic sea ice loss? Is it controlled by the PDO or ENSO? I thought the high pressure was moving over Greenland because that's the only place cold enough for it to form (Cold Pole)? I'm also not sure about the shift to fewer clouds, as there's an increase in water vapour over the Arctic, coming from lower latitudes and from the Arctic Ocean itself, because of Arctic sea ice loss. In fact, increased cloudiness in autumn and winter (especially these past two winters) are causing record low maximums, this year for both extent and volume. All in all, I feel that this is all very theoretical and these scientists aren't paying enough attention to what is happening on the ground. We may have passed the point where our knowledge on the Old Arctic has become moot. This is a non-story, because no one has said that all of Arctic sea ice loss is 100% caused by AGW*. It might be, but we can't know for sure. It might even be more than 100% if natural variation would otherwise have caused the ice to grow. We don't know. But we do know for sure that the AGW influence is not zero. Now, if climate risk deniers are acknowledging that 60% of Arctic sea ice loss is due to AGW, they are also acknowledging that this might be killing Chinese people, which in essence means they are no longer climate risk deniers. If they keep lying to their fellow human beings about AGW, they are in fact extra responsible for killing Chinese and many other people. I'm sure they see it differently. And if they didn't, they probably wouldn't care. * There are a number of papers out there looking at the influence of the AMO and the PDO, etc. Or read this blog post I wrote 4 years ago about Judith Curry, Walt Meier and Ron Lindsay agreeing on the anthropogenic component of Arctic sea ice loss. BTW, thanks a lot for opening this separate thread, Archimid! RS had a pertinent post in this regard recently and it referred to this conversation on Youtube. A little long btw, so maybe get some popcorn or something. Dr. Richard Alley, Dr Michael Mann, and Dr Johnathan Brockopp discuss the extent of the global warming crisis without false equivalency given to climate change deniers. Video source: Conversations — Live Climate Change. The authors propose that a substantial amount of the recently observed summer decline in Arctic Sea Ice has been driven by natural variation in atmospheric circulation. At least in the abstract, the authors of the original paper never claim anything related to natural variation. The authors only speak about atmospheric circulation variation. Whether that atmospheric circulation variation has changed due to human changes does not seem to be addressed by the paper. From what I understand from this paper, their models held atmospheric circulations constant and varied the rest of the model. The result was that they obtained only a fraction of the melting. To me, that means that atmospheric circulation is a more influential factor than whatever variables they varied on their model. That is important, specially when they can quantify the proportion between atmospheric impact and the impact of the rest of their model. "Arctic sea-ice cover has declined precipitously in recent decades. Now research suggests that a sizable fraction of this observed historical decline could have been caused by internal climate variability rather than by human-induced warming." The abstract seems to conflate "climate variability" with "natural variability". Those are two very different things. There is no such thing as natural variability anymore. There probably hasn't been for decades. The current climate variability is already heavily influenced by human induced warming. The warmer it gets the larger the departure from natural variability. I am glad to be of a small help. Opening threads is a little daunting because it may seem rude to some, but it seems to me like it is a good way to not lose important information while keeping the thread discipline needed to keep information compartmentalized. Thanks to Archimid for setting up this discussion thread on Arctic Sea Ice Changes: Natural Variation vs Human Influence. It appears that Ding et al, 2017. “Influence of high-latitude atmospheric circulation changes on summertime Arctic sea ice”. Nature Climate Change. is an important paper that addresses the widely recognized issue that the observed decline of Arctic Sea Ice is not projected by existing models. It further appears that this paper will stimulate a lot of discussion. Thus, opening a new thread to discuss this topic is useful. btw, check out this link to see the data, ie. click on 'PDF as submitted', in the first paragraph. i wonder if they include continental drift in natural variation? thanks for the link to stoat and the paper, always nice to see scientific papers without paywall. I haven't read it yet, but admit that arctic amplification is not entirely anthropogenic. Of course the usual suspects take this on a ride. Wouldn't be surprised if the study does not say what the usual suspects say it says. It is true if you say: Arctic volume loss is 60% due to changes in atmospheric patterns. It is false if you say: Arctic volume loss is 60% due to natural variation. Decadal trends in hemispheric circulation are also affected by global warming. This looks to me like a concerted effort to remove human guilt for current and future Arctic conditions. Too bad that won't change the outcome. Humans are 100% responsible for the current record low Arctic conditions. If it was up to natural variation the arctic would be experiencing record growth. Basically they are saying that the reason why the Arctic ice is melting faster than model predictions is due to a variation in circulationt, with increased high pressure over Greenland. This change in circulation matches observations, and when the models are forced into this circulation change the modelled sea ice matches observations. This seems to be strong evidence (maybe not conclusive) that the increased sea ice melt is due to this circulation change, and is not due to loss of ice structure/strength, or a failure to include enough albedo effects, or failure to account for warming from the oceans below or mixing of the halocline. The question then is whether the circulation change is a feedback to the ice loss, or to some other aspect of AGW. They argue that it is not as the models do not show the circulation change. However perhaps the models are missing a factor whereby AGW or ice loss leads to this circulation change. The final key would be to understand what is causing this circulation change. If it is a naturally driven variation then presumably someone can uncover the mechanism by which this variation is driven over a multi-decadal period, similar to how we currently understand much of the mechanisms of how ENSO works, and some behind PDO and AMO (but a lot of gaps in our knowledge there IMO). Until we understand this variation better it would remain possible that it is AGW forced in some way that the models cannot currently capture. I'm sure this isn't the last word on research into the model-observation gap for Arctic ice loss. I would note that all the research I am aware of on this topic does point to natural variation being the cause. Is anyone aware of any research providing evidence otherwise? I agree. You have identified a key point. Assuming that a circulation change is driving Arctic Sea Ice melt, is this circulation change a natural variation, or rather, a change due to external factors? That is, assuming that an atmospheric circulation change has been an important contributor to the observed reduction in Arctic Sea Ice, is this hypothetical atmospheric circulation change a natural variation or is this proposed circulation change itself a result of climate change? The paper seems to say that they took out the change to atmospheric circulation to see the change in sea ice caused by AGW alone. But did they run the model again taking out AGW to see the change in sea ice when only change in atmospheric circulation is included ? And if they did, did adding the reduced effect from each model run = the total observed change in sea ice? I doubt it - in all the models on any subject I have made there is a multiplier effect. It is also surely dangerous to assume cause and effect in a uni-directional manner. Models usually use iteration which implies changes in parameters cause changes in other parameters which in turn.. However, I will not be surprised if Jim Hunt is writing about climate-gate-3 after this weekend's Breitbart News and Daily Mail. This looks to me like a concerted effort to remove human guilt for current and future Arctic conditions. Why do you believe Axel Schweiger (PIOMAS) or Eric Steig would sign on to any paper with that objective? Sorry ktonine, I should have been more explicit. I don't think the authors of the original paper are acting with malice. The original paper seems to me like good science. However, the secondary articles that reference the original paper and are conflating atmospheric variability with natural variability are the by product of malice or ignorance from the science communicators. The final key would be to understand what is causing this circulation change. If it is a naturally driven variation then presumably someone can uncover the mechanism . . . Until we understand this variation better it would remain possible that it is AGW forced in some way that the models cannot currently capture. (Michael Mann): But misfit relative to CMIP5 mean doesn't imply internal variability! CMIP5 mean likely does NOT capture true forced trend. The arctic is losing sea ice much more rapidly than the models expected. Michael Mann asserts that they have simply made an assertion based on an assumption that atmospheric circulation 'misfits' within the CMIP5 ensemble are natural and that all anthropogenic drivers of circulation changes are captured within the model. I agree with Michael Mann - this is an obvious attribution overconfidence in the model's capabilities - the attribution is glaring and not good science. Even more reprehensible is that when the arctic DOES melt out so much earlier (with devastating global consequences) this paper, with its selfishness and unscientific assertions will be used to allay the global response to the climate emergency, reducing the effectiveness of our collective response to the crisis - since this paper says the natural variability component is so large and, if those 'natural' forces revert back (magically) then the sea ice may just recover, so we don't have to do the hard work of cutting CO2 emissions. . . just yet. summary: This is the most egregious example of placing the entire world at risk through protecting personal self-interests that I have ever seen from reputable scientists (read: not paid climate deniers) and shows that, just because you are a scientist, you are not necessarily a good or even a moral person. The paper seems to say that they took out the change to atmospheric circulation to see the change in sea ice caused by AGW alone. Brilliant. Perhaps they should take out the atmosphere altogether. Then they could observe that daytime would be hot enough to boil water, and at night it would be cold enough to freeze CO2. ...and humans would plainly have nothing to do with it! as well as my own initial question? All this excitement in the Twittosphere and elsewhere leads one to wonder whether Ding, Schweiger et al. saw (or should have seen?) all this coming, and if so what might have been done differently? jai - have you read the full paper? This conclusion assumes that the CESM accurately reflects the response of the high latitude circulation to anthropogenic forcing. Attribution estimates of Arctic sea ice loss based on CESM therefore need to be viewed with caution. As to the CMIP5 criticism, isn't that covered right in the abstract? CMIP5 represents the expected model response to AGW. Observations disagree. Models wrong, observations wrong, results due to other than anthropogenic forcing? Their assertions are not substantiated by their claims, caveats be damned. This is a CYA paper and should be viewed as such. Come on, this isn't a CYA paper. It's a genuinely interesting subject. which wouldn't have garnered nearly as much as attention, if it hadn't been spun and, like Archimid says, most so by that Nature article preview. The fact is that this just isn't all that exciting. First of all, no one has ever said that all of recent Arctic sea ice loss is caused by AGW. Not because it isn't, but because we can't know for sure (although the downward trend definitely wouldn't be so steep if it wasn't for AGW). Secondly, there have been many more papers trying to pin down the amount of human attribution as compared to the AMO, the PDO, etc. Climate risk deniers are dumb to spin this, because it automatically means they acknowledge the climate is changing. And Arctic sea ice loss is most probably just going to continue, especially if that 60% figure is wrong (which it might very well be), and so the consequences of this loss will become ever clearer. Climate risk deniers are sad, old, selfish, white men with an authoritarian streak. It's best to ignore them, and not get worked up too much. I guess you are right Neven, it is impossible to say if this is a CYA paper from entrenched arctic scientists who have dedicated their lives to learning and teaching about these things or if their unsubstantiated interpretations of global atmospheric circulations being 'natural' even though recent studies indicate a significant anthropogenic component (due to many feedbacks, ENSO impacts and aerosol impacts) are rather based on institutional thinking, bias toward confidence in their previous work (models), failure on the SLD (Side of Least Drama) and trying to find a reason an explanation why their models are so pathetically, horribly, dis-servingly off base. In any event, I assert that, once the arctic melts out (and I have said very clearly that I expect this to happen in the next 2 to 6 years) I can guarantee you that we will hear this paper referenced by those who want to do little or nothing in the way of climate mitigation (as we already are). I think it is important to clearly define "natural variability". If the definition of "natural variability" is variability that has not been influenced by humans, then the conclusion is BS. If the definition of "natural variability" is the variability beyond the scope of this model like maybe ENSO, solar cycles, PDO/AMO, snow cover or any other mayor natural phenomena, then the conclusion is correct. It just need to be clear that in that case "natural variability" is being influenced by humans. I don't think once the Arctic melts there will be a blame game. I think we will be too busy trying to survive for that. Even if there is, fossil fuel interests are already very well positioned to forgive themselves for any wrong doing including the genocide their fraud and deceit will bring. Justice will be served by mother nature. She can be ruthless. We have indeed affected earth systems since the begining of history. But after the energy use explosion of the 1800 that influence grew tremendously. Attached is a screenshot of a you tube video that illustrates perfectly human influence on all of earth's naturally variable systems. 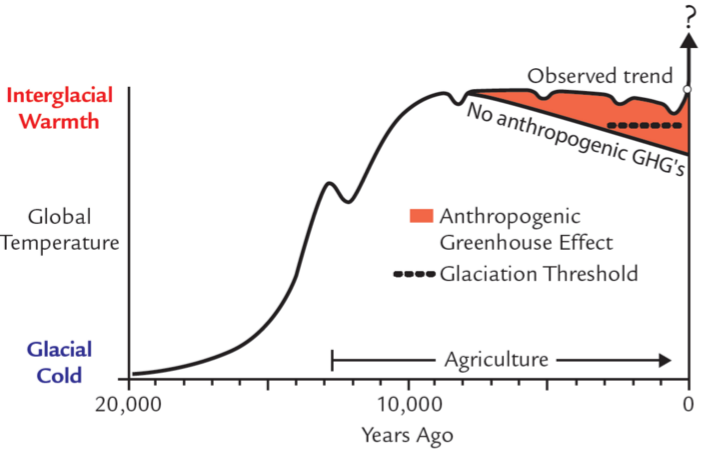 I think it can be argued that for the first few thousand years AGW was very good for humanity. But right now, it is a case of too much of a good thing. If anyone has a better sample of that image could you post a link for it? While the overall thrust of the paper is worthwhile and interesting research, the opening lines seem written to maximise the potential for misleading headlines about a new paper proving that the Arctic ice loss is due to natural variation and not CO2. Perhaps it was written to be deliberately controversial to garner more attention and citations. Is it possible that a paid denier could infiltrate a group of otherwise solid scientists with the purpose of such wording. I know this isn't the first time I've seen a research paper where the bulk of the work seemed reasonable and sensible but the abstract/conclusion/intro seemed written in a manner to maximise the opportunity for false reporting. Is it possible that a paid denier could infiltrate a group of otherwise solid scientists with the purpose of such wording. "At the advent of danger there are always two voices that speak with equal force in the human heart: one very reasonably invites a man to consider the nature of the peril and the means of escaping it; the other, with a still greater show of reason, argues that it is too depressing and painful to think of the danger since it is not in man's power to foresee everything and avert the general march of events, and it is better therefore to shut one's eyes to the disagreeable until it actually comes, and to think instead of what is pleasant. When a man is alone he generally listens to the first voice; in the company of his fellow-men, to the second." freaking awesome. thank you jai mitchell! This resonates well with my thinking. Most other responses accept that the variability is natural without question. “This new work by Qinghua Ding and others – involving an analysis of the observational record of sea ice and numerical model testing to root out the causes of long-term decline and yearly variations in Arctic sea ice – does well to explain links between long-term weather in the Arctic and year-to-year variations in sea ice on the same time frame. In other words, weather and sea ice melting and sea ice extent are connected, and Arctic weather is connected to weather elsewhere in the world, even as far away as the tropical Pacific Ocean. “The already well-established, if imperfectly known, many-decades-long climatic connections to human root causes of the decline in sea ice are not this paper’s focus. Even so, these authors’ and others’ work shows that burning of fossil fuels is having a large direct impact in contributing to rapid sea ice declines. This paper does well to explore the effects on Arctic sea ice of year-to-year variations in Arctic and global long-term weather. The paper does less well to explore how the ‘weather’ part of the variations are also connected indirectly– partially– to rising greenhouse gas abundances. Just a few comments regarding Ding et al, 2017; “Influence of high-latitude atmospheric circulation changes on summertime Arctic sea ice” and also the discussion of this paper. Given that Nature Climate Change is a well-respected high profile journal with a rigorous peer review system, it appears that this paper is potentially important. The observed rapid decline of the Arctic Sea Ice is not explained by current hypotheses. Thus, there is a need for new ideas. I do not agree with the notion that the scientists who did this work have motives other than advancing climate science. I further do not agree that the scientists who study this topic lack insight and creative thinking. Regarding ‘models’ I have a somewhat different understanding than what is commonly expressed about models. I view climate models as hypotheses. Given that scientific understanding is inherently tentative and incomplete, of course these models (hypotheses) have limitations. The point is to pursue the scientific method. With a complex system like the geophysics of the Arctic, computational simulations of recognized processes makes sense. As many have reiterated, the observed rapid decline of Arctic Sea Ice is not explained by present understanding of the function of the climate system. New insight is required. “Influence of high-latitude atmospheric circulation changes on summertime Arctic sea ice” appears to be an interesting contribution to the discussion. I agree, and admit I haven't digested the paper in detail yet, but am skeptical that some/much of what they attribute to "natural variation" which may actually be driven by climate change outside of the Arctic. More later after I've done due diligence. I agree that you have recognized a key point, "I agree, and admit I haven't digested the paper in detail yet, but am skeptical that some/much of what they attribute to "natural variation" which may actually be driven by climate change outside of the Arctic." Michael Hauber made this same point in the discussion above. If a circulation change is promoting the melt of the arctic sea ice, is this circulation change a natural variation, or is this circulation change the result of human activity? I think that that is the big question. I've only seen the abstract, so perhaps the full paper explains this better. I've only seen the abstract, so perhaps the full paper explains this better. I think this paper is bad news for the ice(and us). It weakens arguments that because of the enthalpy of the Arctic the ice is safe for many more years. Particularly if the atmospheric circulations keep changing due to changes in Earth systems other than the Arctic. I think the causation here goes multiple ways. Atmospheric currents change the ice and changes in the ice change the atmospheric currents. The same for the atmosphere Pacific sst interaction. Changes in the atmosphere change Pacific sst's and viceversa. Causation. It is a mugs' game to separate individual causations in an interdependent circular system. I am sure that this recent paper used the most rigorous methodologies. But when the answer is "42" because the question was wrong ? (Pace Douglas Adams). Don't worry Archmid the paper has nearly both feet squarely in the 'old Arctic' and it is difficult to see what actually remains of that? This year is the earliest possible return of the perfect melt storm and would be bang on time for the two before 07' but do we really expect one??? The circulation is now far too messed with to rely on that 'old Arctic' cycle so how many other past cycles are now relegated /retired? Or even when both the question and the answer were right, but you were trying to reconcile them with the wrong set of rules. Viz: 6x9=42 ... but only in base 13. As Arthur Dent might say, "There must be something wrong with the Universe." I think this sums it up pretty well. Similarly, I expect the denialistas to claim that the arctic ice isn't melting, it's being blown out the Fram, ignoring the fact that the ice fragmentation and mobility didn't exist at this time of year 20+ years ago. I am willing to give the authors the benefit of the doubt but considering how much of a hot button this is, I think they could have done a much better job of framing their position. I would have expected the peer review process to point that out. That said, it wouldn't be the first time an academic published his findings without considering the implications in a larger world. This is so unfair to the scientists. They are trained in mathemathics and science, diciplined knowledge and documentation not in public relations or public policy. They shouldn't have to to worry about sounding too climate change denier or too climate change alarmist. They should just do the best science they can and report it as accurately but also as clearly as possible. Bear in mind denialists, like good populist politicians, will always find something to latch onto. After all many of them are paid to do it, and the others are fervent believers in their "cause". I doubt wording it differently would make any actual difference in the world. This is so unfair to the scientists. They are trained in mathemathics and science, diciplined knowledge and documentation not in public relations or public policy. I respectfully disagree. Scientists are not a different species and they exist in academia, which is one of the most political environments there is. Every action has consequences and we all should be accountable for our actions. To say that a scientist is exempt from the the realities of life is to just reinforce the "ivory tower" stereotype. I agree, but you make my point for me. It is well known that deniers will take anything even faintly ambiguous and spin it, which makes it all the more important to be clear. Just because a denier is waiting to pounce is not an excuse to not do the best one can. I think Archimid means scientists aren't necessarily good at public relations or public policy, and I think that's true [even if it's a stereotype]. One reason is that science requires honesty, while public relations and public policy are both prone to gaming by the unscrupulous. If a system doesn't constrain cheating, then cheats have an advantage. Another reason is specialisation. I work in a business that has both scientists and salesmen. I'd never ask a salesman to perform research, because the result would be nonsense. For the same reason, I hate it when scientists try to do sales. There are of course individual exceptions. There are some people that sell solutions such as in the information communications and telecommunications field that have no legacy solutions to protect and can afford to be succinct to the point and honest and with a take it or leave it attitude. I watched a scientist delivering a spiel to the Australian senate last year and took the fellow about 10 minutes to say what I would have said directly in 30 seconds. As soon as a coal dust covered senator launched a lame attack back the guy crumbled and started mumbling another 10 minute almost unintelligible retort. I personally had a come back in mind that would have stopped the guy in his tracks in 10 seconds. There are many factors when it comes to this problem but I have seen that kind of behaviour often now in relation the the climate debate. Know your audience be ready to lay it out in terms they will understand. When the consequences are dire and there is a sense of urgency I think one has to state the hypothesis quickly and clearly first and then go into the data. Maybe the climate change effort needs to identify the best spokes people to speak to the public and the other parties. A what are your experiences and what are you seeing approach will start to work now as the evidence in the environment is overwhelming. Where are the media campaigns funded by concerned philanthropists with the right spokes people. Every day I walk down Orchard street in Singapore past every shop with no front doors and air conditioning blasting into the street to entice you in. All of South East Asia is like that with 600 million people here.